Over the years, this recipe has been perfected with extra spices and Guinness, as well as long simmering until the meat is ultra tender. You’ll need a 12- to 14-qt. pot; if you don’t have one, borrow one from a friend, or visit a restaurant-supply store. In a 12- to 14-qt. pot* over medium-high heat, cook onions and carrots with olive oil, stirring occasionally, until onions are golden, 15 to 20 minutes. Drain any liquid from corned beef. Add beef and seasonings from packets to pot along with vinegar, stout, mustard seeds, coriander seeds, peppercorns, dill seeds, allspice, and bay leaves; then add water to barely cover beef. Cover pot and bring to a boil over high heat. Reduce heat and simmer, occasionally turning beef over and adding water so meat is mostly covered (after a while it will start floating), until meat is tender when pierced, 4 to 5 hours. Meanwhile, scrub potatoes, cut in half, and put in a bowl or bowls of water as they’re prepped to keep from browning (set aside for up to 2 hours). Cut cabbage in half through core, then through core into 12 wedges (the core helps hold pieces together). Drain potatoes and add to cooking liquid in the pot, then set cabbage in pot (some wedges will rest on top of meat). Cover and return to simmering over high heat; then reduce heat and simmer until cabbage is tender when pierced, 15 to 20 minutes. Scatter parsley over corned beef if you like. 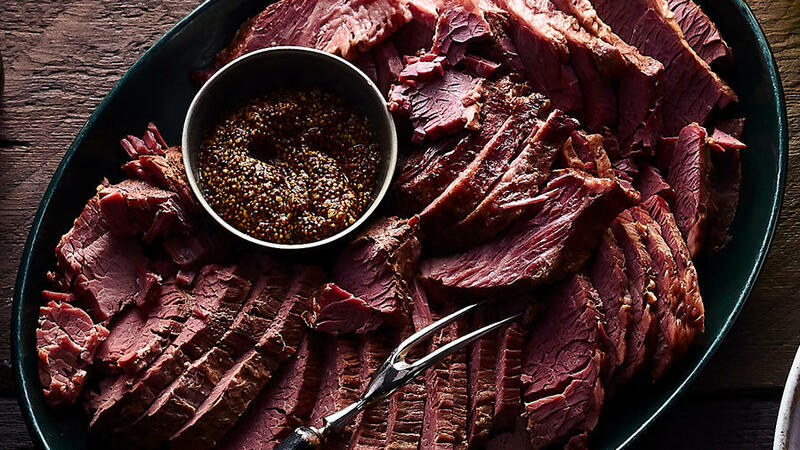 Serve corned beef and vegetables with mustards. *Patrick likes the flavor and texture of Shenson corned beef. Find large sauce pots and stockpots at webrestaurantstore.com.